In a world defined by consumption, we are what we own. 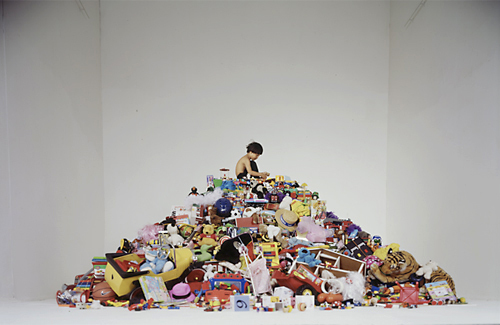 In “Belonging”, we see a small boy sitting on a heap of toys. 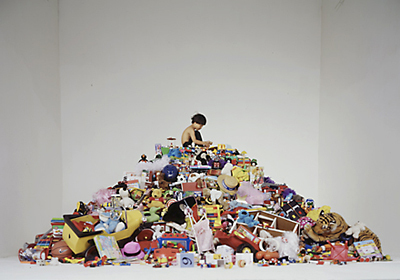 It is a documentary portrait, in the sense that all the objects are the child’s own, but above all, it is a metaphorical image about consumption and excess. 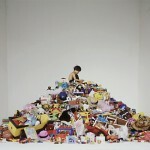 In the Western world, children are constantly exposed to commercials for toys. Cheap plastic toys are imported from China and distributed for free at fast food restaurants. Generally, they will break in a few days and be replaced by new things. Sometimes, presents are given as a compensation for lack of time and affection. At such a young age, children are already introduced to the rules of the consumer society. They learn that things are easy to come by and expendable. This is in stark contrast to the conditions in less fortunate societies. The scale was the starting point for the photograph. The amassed toys are several times larger than the boy himself. The title raises questions about consumption as an expression of personal identity.